December 2018: Get the Artist Booster Pack for 30% off! Looking for a boost in your workflow with Studio One Artist… This will do the trick! 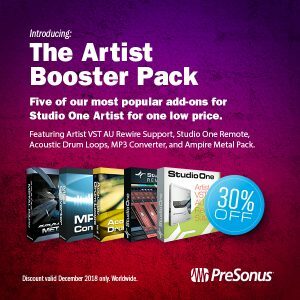 Grab the Studio One Artist Booster Pack for 30% off for the month of December right out of the PreSonus Shop! Studio One Artist is a powerful DAW–the Artist Booster Pack takes it next level. With this bundle you get five of our most popular add-ons for Studio One Artist for one already-low price that has now been discounted by 30% for a short time. Use your third-party plug-ins in Studio One. Control transport and fader functions with your iPad. Create interesting grooves for any style of music. Import and export files in MP3 format. Includes 6 high-gain amps, 6 cab sims, and a metal drum kit. This pack is compatible with Studio One versions 3.3.3 and higher. Posted in Promo / Discount | Comments Off on December 2018: Get the Artist Booster Pack for 30% off!